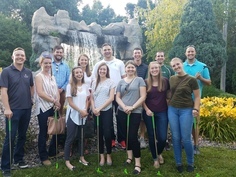 On Wednesday, July 18, members of the APWA Young Professional group got together for the 4th Annual Mini Golf Outing! We had 14 golfers enjoying the beautiful summer day at Richfield’s Malt-T-Melt course for a game of 18 holes. With four teams competing for the crown this year, our winners were Christina Orlowsky, Miranda Swanson and Stephanie Hatten. Congrats to our winners! After golfing, the group enjoyed networking, refreshments and a little bingo at the nearby brewery, Wild Mind Ales.